MSD has finished an eight-month repair to one of its larger sewer lines, an 84-inch diameter that sits more than 20-feet below Main Street. The pipe carries 40 percent of the community’s wastewater to MSD’s Morris Forman Water Quality Treatment Center for proper treatment and release to the Ohio River. Crews began removing the three linear miles of “pump-around” on December 12, completing that task by December 21. The pump-around has handled the wastewater flow during the repair, allowing sewer service to continue to the area. The removal process will require a few temporary roadway closures. “We appreciate the patience of the business and tourism entities located in this vibrant corridor of our community during this emergency repair of this pipe, which is vital for the health and safety of our community.” — MSD Executive Director Tony Parrott. 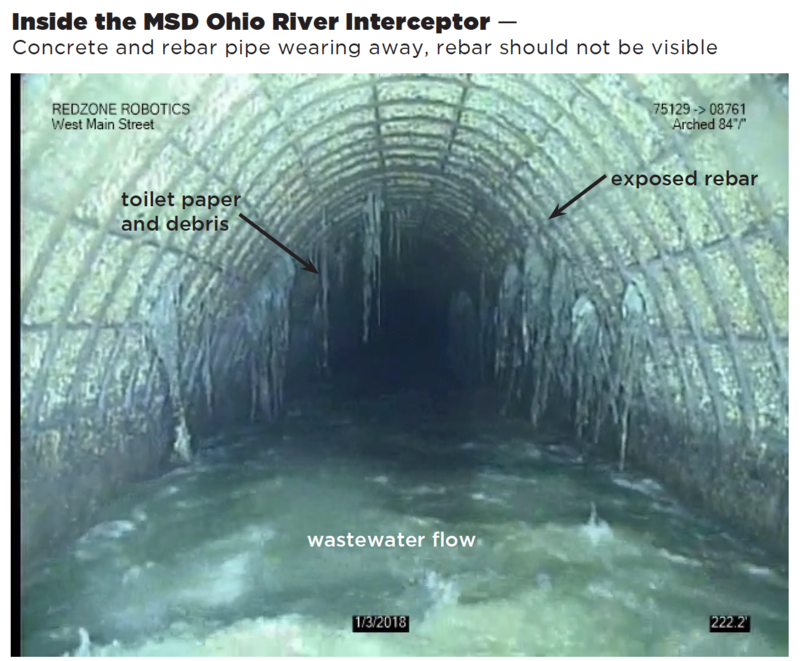 MSD commissioned an inspection of the concrete Ohio River Interceptor — an 84-inch sewer pipe — in November 2017 and used technology that allows engineers to analyze the pipe without having to empty it. The resulting March 2018 report, reveals that some of the concrete and rebar support systems have worn away between Fourth and Seventh streets. MSD closed the southside parking lane on Main Street between Fourth and Seventh streets in April to ensure public safety from the threat of a potential cave-in of the pipe. Work then began with a team of consultants to develop a plan to repair this vital infrastructure with the least disruption to this vibrant area of our community. The $20 million repair project required a “pump-around” to remove wastewater flow from the damaged section of pipe so that workers could go underground and make repairs from within the 7-foot tall pipe. Workers entered the pipe through existing hatches in the pavement at Fourth and Main streets. Constructing the pump-around required seven weeks of basically building a temporary sewer system on the surface with four parallel pipes, which total three linear miles. Wastewater pumped out of the damaged pipe is temporarily re-routed west along River Road to Ninth Street where it re-enters the large sewer pipe and continues its path to MSD’s Morris Forman Water Quality Treatment Center for treatment and release to the Ohio River. MSD contractors completed installation of the corrosion-resistant PVC panels, which mold to the unique shape of pipe to form a new pipe inside of the old pipe. A unique concrete mix was injected into the small space between the PVC panels and the old pipe. This process bonds the new pipe and the old pipe to form a stronger structure. On August 19, a routine in-pipe camera inspection revealed that the potential cave-in had become a reality. Contractors discovered a 5- by 2-foot section of the Main Street pipe had collapsed just west of Fourth Street. Further inspections revealed a large void, or empty space, under the pavement just west of Fourth Street. The void was 40-50 feet across in both directions, and 25 feet deep at the worst spot. The void left the roadway unsupported in the area with a gas and water line suspended in the void. Heavy rains in August compounded the problem by washing the loose sandy soil through into the pipe the hole in the side of the pipe. The force of the water carried this soil downstream in the pipe. The area received more than 4 inches of rain from August 1 through 26, when filling of the void began. Crews worked 24/7 to slowly fill the void with a light-weight grout, making sure the suspended gas and water lines were protected. Surveys show the pavement rose 1.5 to 1.75 inches after the void was filled, as compared to surveys before the void was filled. Traffic was reduced to only one lane on the north side of Main Street midway between Third and Fourth streets to ensure public safety. An early inspection of the pipe from June 21 shows a deteriorated pipe with exposed rebar, but no cave-in.